It’s funny how they call dating the “getting to know you” stage. If you listen to Love Radio’s late-night DJ Papa Jack, you know what I’m getting at. Many men suppress their carnal ways when they show up with a bouquet of red roses with faux dewdrops. 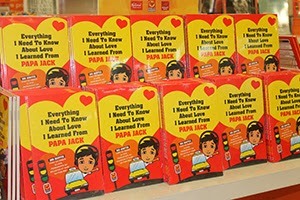 Women bare their souls to Papa Jack: “I didn’t know he was a monster” or possessive or abusive or married. The dark side reveals itself only when you become a couple. Best foot forward means showing off someone else’s foot altogether. The smiles are a little more charming at courtship. There’s a different sparkle in the eyes, and in the hairstyle. A little more thought goes into the getup. A little more oomph. Every moment has got to be perfect. Every encounter magical. Hallucinogenic. Like seeing a unicorn. I won’t be a hypocrite; I won’t deny being one of the many. I’d pimp myself on being obsessed about you—as in you saying yes to me. How would I feel if I sold myself short? What the hell would my barkada say? Let’s say you just bought a brand-new, million-peso car and you’re test-driving it now. Breathe in. Isn’t the smell of leather satisfying? Ah, the scent of success.But consider that value halved the moment the tires land on the pavement. The smell will wear off, the satisfaction will fade, the car will gradually wear out. Sad, right? Just as men. Just like me. Open your eyes. Wake up, woman. Now, even if I’m like the rest of the guys during the courtship stage—and let me apologize this early for the douchebaggery—I’ll be nice and warn you what it’s like when I become your boyfriend. 1. I won’t sit beside you inside the jeepney. I may love you (or not), but hell, no. My love is atypical; unlike that of the guy who rode the jeep I was on lately. Our row was jam-packed, but, because his girl sat there, he forced himself in. Hassle. Because, like me, he spent a lot of time at the dining table. I will pay for your fare— that’s at least P8. So, asking me to squeeze in beside you would be asking too much. I won’t spoil you. Sorry, not sorry. Find comfort in the thought that, maybe, just maybe, I want you to have some elbow space. That beyond the jeepney, in real life, I won’t deny you your God- and country-given liberties. I will trust you. You wanna go have a drink with your ex? Go ahead. Maybe because I love you, I will let you go with whomever you want. I have faith in your fidelity kuno. P.S. If we’re taking the bus, don’t you worry, I’ll definitely sit beside you. 2. I won’t carry your freaking bag. Not even in the next lifetime. I’ve consulted my mom and she said I wasn’t conceived to slave for you. And I believe that God didn’t create you to slave for me. Frankly, I didn’t get a degree to carry baggage I know damn well you can bear. And you didn’t get yours to ask me to assist you with every single stone the universe throws at you— even pebbles, emphasis on pebbles. Let’s just say I don’t want people calling you weak. Or saying your strengths depend on mine. T*** i**, bag lang ’yan! In the grand scheme of things, even if we don’t end up together, at least I have taught you independence. Big word. Then again, if the laws of physics tell me that your bags are beyond your capabilities, I’ll carry them. Luggage? Sure. I just don’t want your handbag, baby. Really. Unless it has two bowling balls. Or gold. I don’t use my cell phone to “connect.” By this, I mean that the moment you buy my courtship ploy, the load fund goes. Therefore, do not expect me to wake you up at a time you set, or to text you a “good morning” or “good night” with “<3” every single day. Please. Just take care of your problems on your own sometimes. I don’t want to know every single thing that confounds you. In real life, you see, I won’t be an open book anyway. Why? Self-preservation. We’re more than friends but we’re not married. (Although if we do get married, I might still hide some secrets. Wala lang, for the thrill.) Just like the market, laissez faire. On the plus side, I won’t ask from you something I cannot give. Am I rare or what? 4. I don’t like thoughtful gifts. I don’t like cards, or an apple a day “because it’s cute.” I don’t want you to make me a cup of coffee. I can buy those, or make them myself on better days. I will act, I repeat, act, all appreciative … but I won’t be genuinely happy. Because I prefer something I can use; something utilitarian. A shirt or a pair of shoes or pants would be fine. Don’t worry about the accessories. I suggest gadgets. We need fun sometimes. How about a PSP? I also won’t refuse a laptop or an iPad. Basta, I prefer my gifts expensive, er, saved up for—with money, not feelings. I don’t need gifts naman every month. Just think about my investments in you. Thanks. Also, just think, if we aren’t forever—and if you’re not the type who wants every gift returned the moment we part— you somehow stay with me. If it’s my fault, your gifts will haunt me. (Good for you.) Maybe not forever. Maybe just a year. Pero at least, ’di ba? Like Bonnie Tyler famously sang, “Love songs won’t leave you, but lovers often do.” Think that, but gadgets. 5. I will say yes, but there’s a catch. Why the hell are you there? When you didn’t have a boyfriend, did you have someone who fetched you? If yes, who? If not, kaya mo naman pala eh. Get it? Own up to your mistakes. You went out alone and suddenly you can’t go home? Malarkey. If you went shopping, why didn’t you call me to go with you? (Which begs the question: Are you ashamed of me?) I could’ve treated you to merienda. Sayang. Of course, with enough prodding, I might just fetch you. Although we might argue after. Unless I really love you. When I was in high school, the Department of Trade and Industry told us through a very attractive PowerPoint presentation: “When it’s too good to be true, it’s not true.” Therefore, if I seem perfect when I try to get you to fall for me, alam mo na. My advice: Try asking around. Let’s just say that when it comes to relationships, I have three constants: independence, practicality and respect. If you accept my interpretation of these three things, what’s your number? But if you’re some modern-day Maria Clara, good luck! Kasing lamig ba ng panahon ang nararamdaman mo ngayon? O baka kailangan mo lang ng pampa-good vibes? Para sa lahat ng kababaihan, ito ang ilang piling quotes at love advice ng LOVERADIO.com.ph mula sa #1 radio show tuwing gabi sa Pilipinas, ang True Love Conversations o TLC kasama ang award-wining radio DJ na si Papa Jack. 5. YOU DESERVE IT, GIRL! ‘Yan ang post ni Papa Jack noong September 15, 2012 sa kaniyang official Tumblr account.